Philips SoundSphere - new Dr Who villain perhaps? 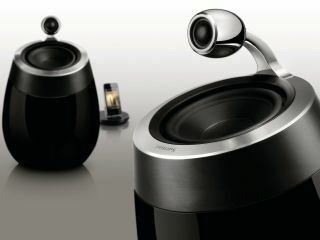 Philips has announced the arrival of the Philips Fidelio SoundSphere DS9800 – a high end dock with AirPlay connectivity. Announced originally back in March, the speaker system is one of the more unusual-looking things we have seen for a while, but that's no bad thing. The DS9800 has a pair of active SoundSphere speakers, with one of the pair brandishing a 110W RMS stereo digital amplifier and a Wi-Fi receiver. The unusual shape of the speakers comes from seven-years of hard slog from Philips which has been looking for a setup that is free from the 'shut in' sound of conventional speakers. This is why the 25mm tweeter system is on the outside, situated above the mid-range driver. Inside the speaker system is a 5-inch woofer and this is all rounded off with AirPlay functionality. The Philips Fidelio SoundSphere DS9800 UK release date is July, with the dock available from John Lewis. Pricing should be around the £699 mark. Look out for a Philips Fidelio SoundSphere DS9800 hands on later, as TechRadar has already had some time with the high-end device.